Any experienced and dedicated chimney mason should be fully equipped with a wide variety of equipment to safely access any chimney. Accessing the chimney should be done without causing damage to the roof. Typically, an aerial man lift (cherry picker), specialty scaffolding, or custom-made roof brackets are used. Because of the severe exposure your chimney is subjected to, it will likely benefit from an application of an appropriate penetrating and breathable water repellent. Water repellents should be applied only after all necessary repairs are made to the chimney. Otherwise, applying the water repellent will likely accelerate the deterioration of your chimney rather than slow it. Not all "sealers" or water repellents are the same! Some actually accelerate deterioration instead of assisting in preventing it! Be very careful when selecting a water repellent. 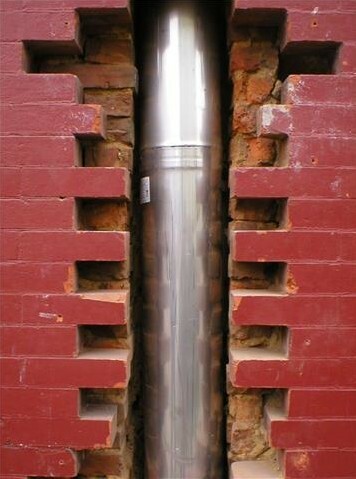 In most cases, masonry chimneys are not designed to handle the venting requirements of modern high-efficiency heating appliances burning liquid propane, natural gas, oil, wood, pellet fuel, or coal. These improperly lined chimneys can cause a number of costly structural and cosmetic problems for the homeowner and also create potentially serious safety hazards. Relining an existing chimney is the most practical and affordable way to repair a deteriorated or damaged chimney. If your chimney does not have a liner, or the liner it has now is cracked or deteriorated, it will need to be replaced. The new liner must be properly sized to your heating appliance, and must be made of the right material to ensure a long and safe lifetime. In most cases, a liner comes with a lifetime guarantee. When hooking to a solid fuel appliance, the liner is usually insulated with ceramic wool insulation. 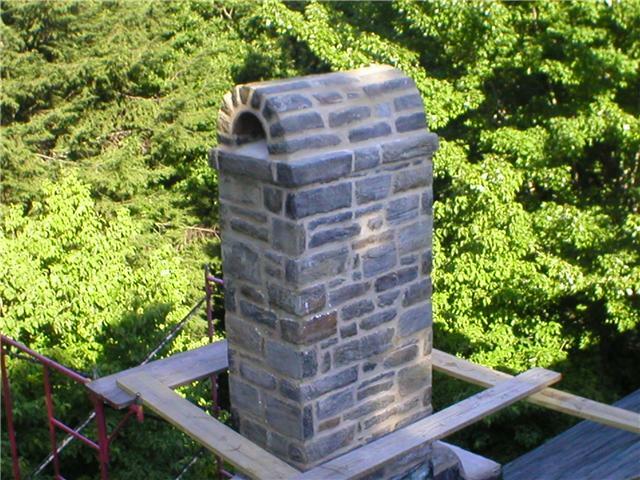 Have your chimney inspected periodically by a licensed, insured, knowledgeable, and experienced chimney mason. Small problems repaired early will save a lot of money in the future. Once a chimney begins to deteriorate, that deterioration grows rapidly if left un-repaired. Make sure your chimney crown (the "roof" of your chimney) is constructed of the correct materials and is designed to function correctly. If it is cracked or deteriorated, make sure the correct decision is made to repair it or remove and replace it with a new crown. If the mortar joints in your firebox or on your chimney need repair (re-pointing), it is critical that the correct mortar mix is used. This mix should be designed and customized by a licensed, insured, knowledgeable, and experienced chimney mason. Most chimneys require a specific custom mortar mix that works in cooperation with the masonry units. This will assure you that all masonry materials used are compatible with each other, and look good, too. Several of these dangers often work simultaneously. The best way to identify the dangers of chimney problems is to call on the expertise of an experienced and trained professional who has a keen understanding of masonry materials science. Only after causes and effects have been determined can the most appropriate and enduring intervention method be recommended. Unlike masonry walls, chimneys are exposed to the effects of wind, snow, ice, and rain from five surfaces - the four sides of the chimney and the top. They are therefore subject to a continuous war of expansion and contraction due to the chimney masonry being heated by hot gases from the fire, and the cold, wet outdoor temperatures. This repetitive expansion and contraction creates a lot of movement and consequently deterioration resulting in a need for chimney repair. Because of the issues detailed above, your best option is to always use an expert chimney mason if you want your chimney to be repaired correctly. Handymen and chimney sweeps are very good at handyman work and cleaning the insides of chimneys, but they are usually not licensed, experienced masons. Neither do they work with masonry materials day in and day out. Chimney repair problems are too important to leave to a novice. W.S. Montgomery Chimney and Masonry Services is qualified, experienced, and ready to take care of your chimney repair problems. Contact us to do your chimney repair job right. Have a specific question about your chimney? or​ click on the above link to send us an email, and we WILL get you the answer.